This was one of the first posts I wanted to write when I started this blog, and 7 months later – here I am! Extras: Does it have any extra features? Look: It looks bloody lovely – matte black (always a winner) with gold writing, gold eraser holder and white eraser. Super cool. Feel: Feels nice to hold, I prefer holding matte than shiny. Write: Writes great, quite a dark grey, must be softer then HB. But no complaints. Extras: The best thing about Blackwings is the flat eraser on the end. The end is cleverly designed so that you can replace the eraser when necessary (you can buy packs of them). 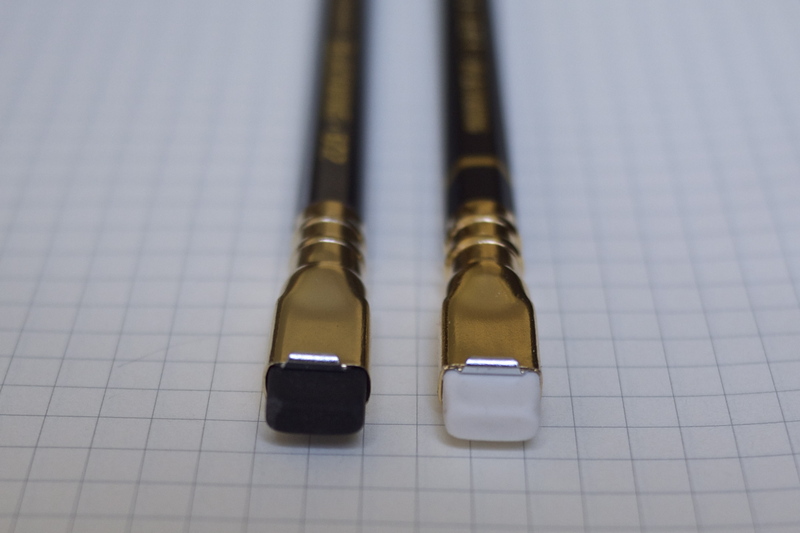 Look: Also very cool, same as the original Blackwing, but with a shiny mid-grey finish, and a black eraser. Feel: Nice, but I prefer the feel of the matte. I also like the heaviness of these pencils, which I guess is down to the eraser. Write: It’s ok… The pencil says “Half the pressure, twice the speed” on the side. Some people may prefer this, but I don’t. I like to feel what my pencil is doing! Look: To me, this is a classic design (along with the yellow and black version). I’m not sure about other countries, but these are a staple in UK schools, so for nostalgia alone, I love it. Feel: Fine, much lighter then Blackwings, even though it has an eraser too. Write: I don’t have much of an opinion about this one, maybe because t’s what I’m so used to using. It does the job just fine. Extras: Has a pink eraser. Look: Glossy black, quite a lot of wording on it (possibly a bit busy…?). I like the gold ring around the end of the pencil. Write: I was a bit disappointed with this one actually.. Quite dark in colour and I think it will wear down quite quickly. Maybe not worth it for the price. Look: Racing green with gold writing and a metallic gold cap on the end (which doesn’t do anything but is a nice design touch). I like it. Write: I’m impressed with this one. Doesn’t wear down too quickly, so you feel like you’re using the right amount of pressure. Look: Matte black, with white writing and an orange stripe around the end. Pleasing. Feel: Nice grip, because of the matte finish. Write: Quite light in colour, but doesn’t wear down quickly. I like it. Extras: None – but worth noting it’s made in England, which is nice. Look: Pleasingly simple, plain wood, nothing else. Look: Dark green glossy, with lots of gold writing. Unfortunately, probably the worst looking of the bunch. Feel: Ok, a little slippery. Write: I like this A LOT. Quite light in colour but wears down really slowly, so keeps its tip sharp for longer. I prefer my writing with a fine nib, so this one is perfect. Look: SUPER cool – as in the rule that all matte black things are super cool. Even the wood in this is black! Write: Really nice, very similar to the Castell 9000 above, but I think possibly a slightly softer lead. Well, when I started this I though I’d find it difficult to have anything different to say about each pencil, but turns out there is a lot of variation! They all (ok, most of them…) have their merits, but in terms of a favourite, there isn’t one that totally does it for me. Instead, I’m going to choose one favourite for looks, and one favourite for functionality. Looks: It’s GOT to be the Palomino Blackwing doesn’t it? Just really cool (I guess I’m shallow), and cleverly designed. I don’t even care that it’s slightly softer a pencil than I’d usually go for. I’d be proud to have it on my desk. Functionality: In terms of writing, I liked the Castell 9000 the best! Annoying that it’s such a boring looking pencil, but it just suited my writing the most and made it look neatest. So there you go, that’s my lot. Now, what glaringly obvious omissions have I made? Please let me know! And what’s your pencil of choice? Have you considered a Derwent with a B lead? Normal pressure leaves a light line but I get around that by retracing emphasized lines once or twice. Draughtsmen’s 314 pencils are a bit darker than HB but can form a useful chesel facet after sketching. Carpenters pencils (rectangular in cross-section and sharpenable by either a purpose-built sharpener or a pen knife) generally come in HB, prodice medium to dark values and can lay down a variety of line-widths just by rotating the pencil. Great suggestions – thank you! I haven’t tried any other Derwents, but would be keen to. Yes, I do love a carpenter’s pencil. I have no need for one but I bought a staedtler one recently, just because I like the shape! I apologize, please read the first sentence as “a Derwent with an an H or H1 lead”.